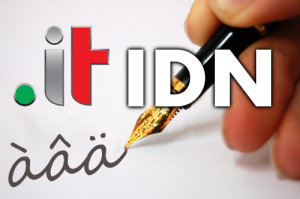 .IT IDN (Internationalized Domain Names) are domain names represented by Italian language characters. Such Italian domain names could contain accented letters or non-Latin characters. Recently, much effort has gone into making domain names available in character sets other than ASCII, making the Internet more accessible while preserving a naming system that is globally unique and resolvable. Existing Italian country code domains are going to continue to function as usual with new IDN country codes extensions created. .IT IDNs are giving everyone the opportunity to register domains which completely match the name of the person, company or brand name chosen. It is possible to register .IT domain names with non-ASCII characters such as à, â, ä, è, é, ê, ë, ì, î, ï, ò, ô, ö, ß, ù, û, ü, æ, œ, ç and ÿ. With the introduction of localized letters, Italian domain registry extended the registration of .IT domain names to entities that have citizenship, or reside or are based in the following countries: IS (Iceland), LI (Liechtenstein), NO (Norway), SM (Republic of San Marino), VA (the Vatican City) and CH (Switzerland). Although local presence within European Union or listed countries remain required, companies outside Europe can register via Web Solutions’ Trustee service for .IT domains, which is provided without additional fees. Use the domain name search form located below where you can register new .IT domain name or contact our support team at support@web-solutions.eu on how to register your IDN .IT domain.